I made a last minute decision to buy a ticket to BookCon and I'm so glad I did! 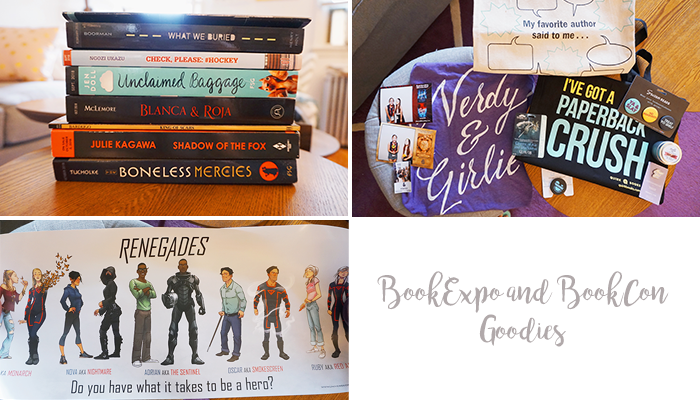 I haven't gone to BEA (Book Expo America) in the last couple years but thanks to my blog and the lovely publishers I've gotten to know, I still get to feel a part of it through invites to blogger events and dear friends who pick up books for me. But I have to say, this was the first year where I really wished I could've gone to BEA myself. And it's because I had so much fun at BookCon walking around with friends. Honestly, it's surrounding myself with people who love books just as much as I do, getting to meet authors and having three days off from work (just being real) that I missed the most. I'm definitely going to try my best to go next year. 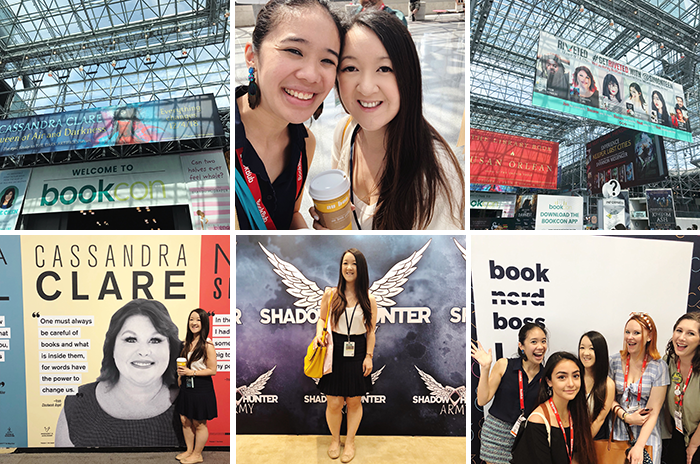 So here's how my BEA/BookCon experience went! On Friday night, I started off by attending the Macmillan Happy Hour with Alexa, Kristin and Jane. We got to mingle and chat with authors like Leila Sales and Anne-Marie McLemore. (I only got a glimpse of Leigh Bardugo but she looked fabulous like always.) From there we headed to Big Honcho Media, where I got to be Alexa's plus one for the second year in a row. 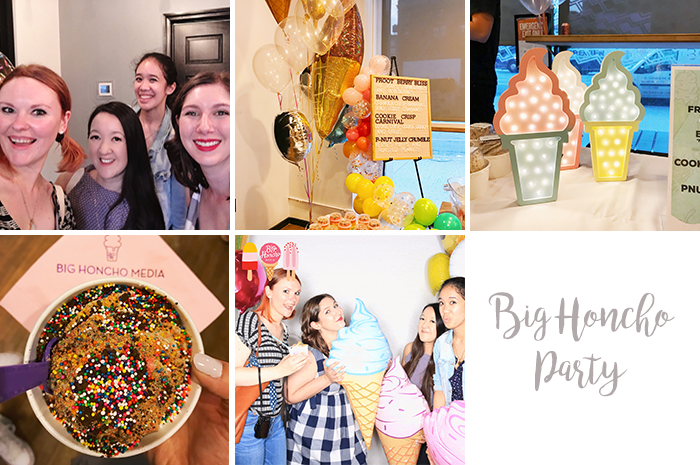 They seriously had the best idea ever for a party – it was ice cream themed! Milk and Cream Cereal Bar was there plus a whole table filled with desserts. My sugar loving heart was so happy. Then Saturday was the first and only day of BookCon that I attended. Walking into Javitz with all my bookish buddies in tow made me realize how much I missed the excitement of this event, even knowing how exhausted I would be by the end of it. But we all pretty much know how this goes, so it was just as nice to approach is in such a relaxed way. We literally just roamed the floor with absolutely no plans, taking photos and selfies and making sure to say to our favorite pubs. But probably the most exciting thing that happened was getting to interview Sandhya Menon at the show! A few weeks before, Simon & Schuster reached out asking if I'd be at BookCon and if I'd want to interview Sandhya. Of course I said yes and of course, I asked if Alexa could join me since I knew we'd be hanging out together the whole day. It was so fun! I already adored Sandhya because I love her books but getting to meet her in person made me an even bigger fan. I'm definitely on the shyer side, especially when meeting authors I admire, and she put me completely at ease. She's such a lovely person and if you haven't had a chance to read her books yet, I can't recommend them enough. I'm also super proud of the format I came up with for the interview and how it turned out. To watch them, you can check out my Instagram highlights for the first half of interview and Alexa's for the second half. And last by not least, what would a book event be without some goodies? I got a bunch of ARCs from FierceReads which I'll share in more detail later plus Macky (Alexa's husband) did me the biggest favor of picking up Shadow of the Fox by Julie Kagawa for me! It's one of my most highly anticipated books for fall and I couldn't be happier to have it in my hands. Other goodies worth mentioning: the "I've Got a Paperback Crush" from Quirk Books (who always have the cutest totes and are just the nicest), my Nerdy & Girlie tank from Jordandene (I will be buying more from her for sure) and FierceReads book swag. at this event, friends and the Javitz for making BookCon so memorable. 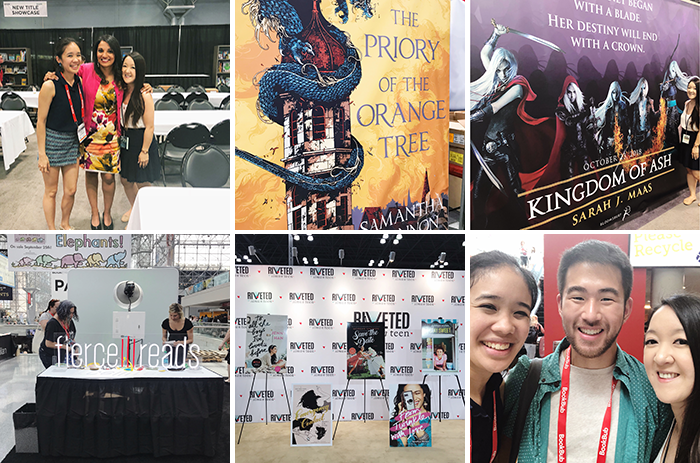 Were you at BookCon? I hope you had a great time! PS. I'll be doing an ARCs giveaway soon and will include a few of these goodies so if you don't follow me on Twitter yet, you might want to! I'm so glad we got to spend BookCon together and I really hope you come for the BEA portion next year<3! And I'm so thankful that we're NY locals so we can hangout throughout the year! It looks like you had such a great time! As much as I've always wanted to go to BEA/Book Con, I've always felt like I wouldn't quite fit in. It's so fun to see everyone's experiences, though!